How An Exiled Activist In Minnesota Helped Spur Big Political Changes In Ethiopia Ethiopia's recent changes are due largely to an uprising by young men from the largest ethnic group, the Oromo. Their inspiration: Jawar Mohammed, who created a media network in exile in Minnesota. Jawar Mohammed, 32, created the Oromia Media Network and used it to bludgeon one of the most brutal regimes on the African continent. At 32, with a mischievous smile and a round, boyish face, he keeps the air of a startup CEO, but Jawar is without a doubt the most controversial man in Ethiopia. The previous government branded him a terrorist, because from exile in the U.S., he created a media network and used it to bludgeon that government — one of the most brutal regimes on the African continent. The Ethiopian People's Revolutionary Democratic Front, the ruling party, was armed to the teeth and controlled the executive branch, Parliament and judiciary for almost three decades. An airtight intelligence operation meant there was little they didn't know, so any potential dissent was dealt with swiftly and violently. There is no comprehensive count, but human rights groups have for years decried vast abuses by the government. People protest against the Ethiopian government during an Oromo festival in October 2017. Anti-government protests by young Oromo men began in 2015 and helped spur political change. "This was one of the most powerful regimes in Africa," Jawar tells NPR. "Supported by the West and China, Russia, together. Even a liberal like [Barack] Obama, who is committed to human rights and democracy, looked at them and said there is no way these guys are going to go." During a 2015 visit, and much to the dismay of Ethiopian civil society groups, President Obama was accommodating of the regime, even calling it "democratically elected." But the regime had one big weakness: In a diverse country, it was mostly led by Tigrayans, a minority ethnic group that makes up less than 10 percent of the country's population. The Oromo — the largest ethnic group, representing more than a third of the population — had mostly been left out. "[The Oromos] have been economically and politically, culturally marginalized for a long time, because the Oromos were always a threat to whoever was in power," Jawar says. "And to prevent Oromos from coming to power, to disempower them ... ridiculing them was very important, demoralizing them was very important." Jawar, an Oromo, saw his opportunity. On his network, broadcasting from Minnesota to Ethiopia via satellite and social media, he decried injustice. He highlighted Oromo history and encouraged young Oromos to be proud of their culture. "I called it the project of building collective self-esteem," he says. Confidence in their numbers — and in who they were — pushed protesters to the streets to demand better governance and equal representation from a minority-led government. And it worked. Beginning in the fall of 2015, thousands of protesters — mostly young bachelors known as qeerroos in the Oromo language — organized boycotts and set up roadblocks, paralyzing commerce. Ethiopia is one of the fastest-growing economies in the world — its GDP expanding at breakneck pace — but the instability led to a 20 percent decrease in foreign direct investment. For a regime whose main promise was development, this was devastating. Eventually, the Amhara, the second-biggest ethnic group in the country, joined the protests. The government crumbled with the resignation in February of Prime Minister Hailemariam Desalegn. 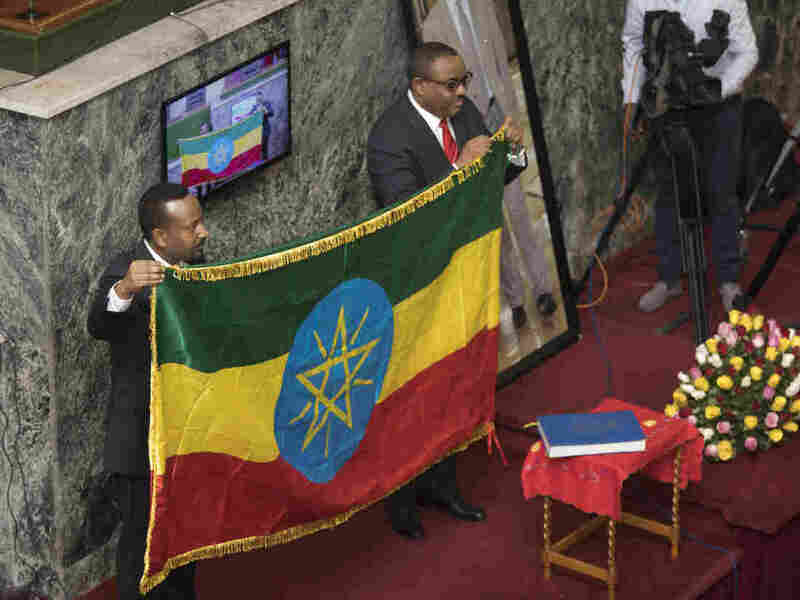 Abiy Ahmed (left) holds an Ethiopian flag with his predecessor, Hailemariam Desalegn, at the Ethiopian Parliament, following Ahmed's swearing-in ceremony as prime minister in April. In August, Jawar returned to Ethiopia as a hero. He had last been there in 2008. The government of new reformist Prime Minister Abiy Ahmed, an Oromo from the ruling coalition, dropped all terrorism charges against him, and Jawar transformed from an outside agitator, an activist, to a political figure with huge influence over the new government. Thousands of people lined the streets, celebrating his return. But across the country, perhaps emboldened by their unlikely victory, young Oromos clashed violently with members of other ethnic groups, and the violence displaced hundreds of thousands of people. On Twitter and in newspapers, critics wondered if the ethnically driven politics that helped push political change had become toxic — threatening to rip the country apart along ethnic lines. Jawar brushes off those kinds of concerns, dismissing them as political barbs with no basis in reality. "When you do things the way I do, you create a lot of losers," he says. "Of course you are going to have a lot of enemies." "We were struggling for the whole Ethiopia"
Driving from Addis Ababa to Shashamane, you notice a couple of things: the vast factories quickly industrializing Ethiopia and the hordes of young, unemployed men hanging out on street corners, waiting for someone to give them any job. Shashamane, a small town about a five-hour drive south of Addis Ababa, is in the heartland of the Oromia region and is one of the places where Jawar's theories about political activism came to life. "You can call it the second Minnesota," Kemal Welyali says. At the peak of the protest movement, images from Shashamane played all over Jawar's Oromia Media Network, showing young men running, crossing their arms in protest, or desolate streets during the nationwide strike earlier this year — not a single business open, not one truck shuttling goods out to the capital. Ethiopian opposition leader Merera Gudina was freed from jail in January. In today's Ethiopia, he says, "There are a lot of clashes of dreams." Kemal played a central organizing role. He took every opportunity to speak about corruption and minority rule, even at funerals and weddings. It was time, he preached, to stand up to a cruel government. He says he spoke mostly to the older folks, because he knew when the young people took to the streets, they would need their elders' support. Kemal stops his car in front of a strip mall. On the day Jawar came to Shashamane, in August, thousands showed up to welcome someone they viewed as their philosophical inspiration. But at some point, the crowd fixated on one man — a non-Oromo whom they accused of carrying a bomb. Kemal points at a lamppost in front of him: That's where the crowd hung the man by his feet and beat him to death. No bomb was ever found. "We were not the ones who hung him," Kemal says, blaming another group for trying to spark a new conflict between young Oromos and police. 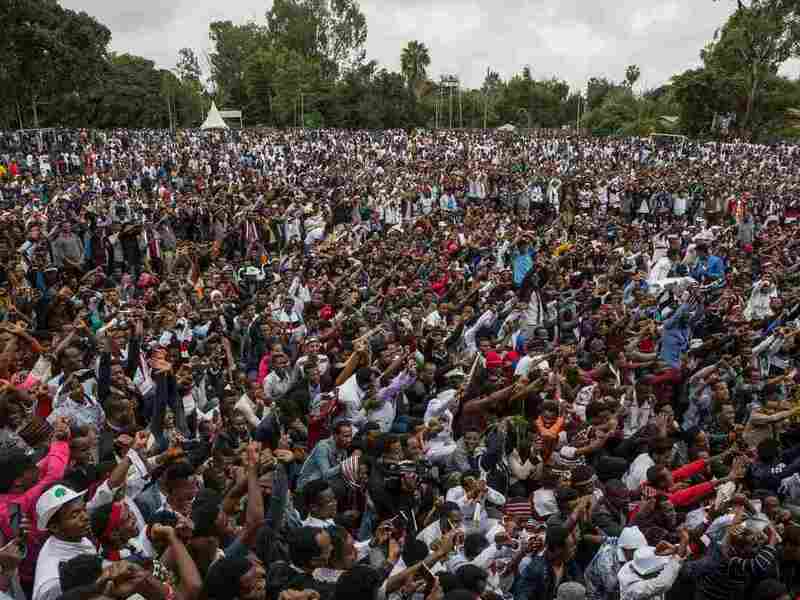 Either way, as images of a mob of young men surrounding the man's limp body spread across Ethiopia, it sparked fears that the Oromos' uprising had empowered violent ethnic nationalism. In the capital, the word qeerroo makes people shudder now. They are radicals, they say. But Kemal says only people who don't know their movement brand them as radicals. Yes, he says, this movement emboldened Oromos and gave them pride, but that was part of a bigger plan. The point of this struggle, he says, was to first bring Oromos together to defeat the old regime and then bring along the rest of Ethiopia. "Our struggle is to bring real democracy," he says. "We weren't struggling for the Oromo tribe only. We were struggling for the whole Ethiopia." 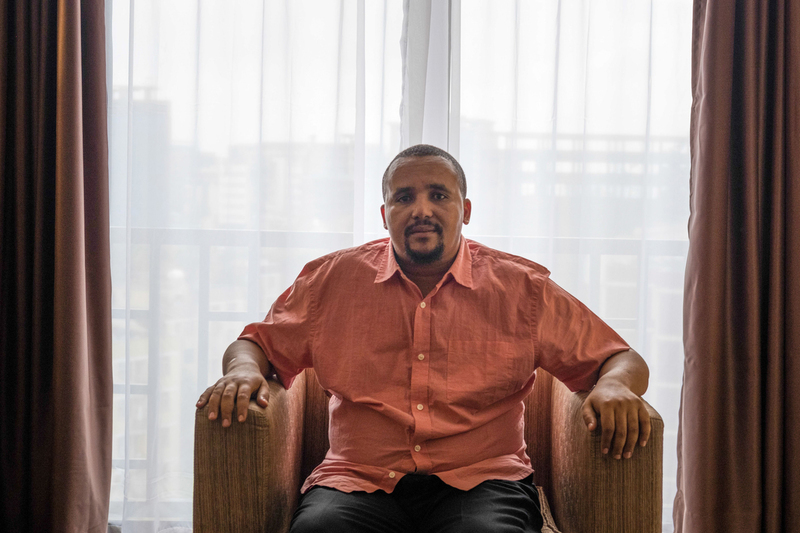 "A vacuum in the middle"
Jawar left Ethiopia for a university in Singapore in 2003. Two years later, he moved to the United States; he studied political science at Stanford and received a master's in human rights studies at Columbia University. As a student in the U.S., he was thinking and writing about Oromos in Ethiopia. In the mid-2000s, he led protests outside the State Department to bring attention to what he said was the mistreatment of Oromos at the hands of the Ethiopian state. He settled in Minnesota, where his wife, also Ethiopian, was a student. Jawar was controversial among Ethiopians from the very beginning of his political activism. In 2009, he wrote an essay highly critical of the Oromo Liberation Front, then a separatist group that had struggled against Ethiopian regimes for decades. It was time to move on, he argued, because it was clear the OLF could no longer serve the aspirations of Oromos. Jawar says he spent time studying nonviolent protests of the U.S. and India, and he paid close attention to the Arab Spring movements. His big moment came about three years ago, when the Ethiopian government moved to expand the capital city, in essence taking more land from the people of Oromia. That sparked huge street protests. At the same time, Jawar launched his media network, which gave young protesters a voice. His Facebook page garnered more than 1.5 million followers and he plastered his feed — and his satellite channel — with graphic content showing clashes between protesters and police. Critics say he exaggerated what was happening in Ethiopia — that he inflated death tolls and even reported falsely that the Ethiopian government had used helicopter gunships to mow down Oromo worshippers during their most sacred holiday. During this period, he was deemed an enemy of the Ethiopian state and was no longer able to return home. His critics said he fanned the flames by framing a lot of this in ethnic terms — as a Tigrayan conspiracy against Oromos. But Jawar sees his role through a more academic lens. He says as this protest movement unfolded, he and other Oromo leaders did recognize the potential for radicalization — and that's why they pushed for democracy. More recent episodes of violence, he argues, don't stem from ethnic division. Instead, he says, this is what happens during political transitions. He's calm and unemotional when he talks about the violence across the country. "When you move from dictatorship to democracy, people move from fearing the guns to respecting the law," he says. "But there is a vacuum in the middle; there is a gap." As Kemal pulls out of the Shashamane strip mall, a heavy rain begins to fall. For years, Kemal was on the run. The previous government tracked his cellphones, so he switched SIM cards hundreds of times. He would stay in a town for a few days, talk to leaders about nonviolent protests and then move elsewhere. His family stayed in Shashamane, and he encouraged his 18-year-old son, Wetumusa Kemal, to go out into the streets. He motions to Wetumusa to show this reporter the consequences of that. Wetumusa rolls up his pant leg, revealing a scar from a bullet wound on his left knee. During the struggle, Wetumusa says, the military was everywhere. It surrounded schools and beat the students in classrooms. Sometimes soldiers would round them up during protests and send them to re-education camps. "They told us to lie down, then they beat us with the sticks and they ran over us with their big shoes," he says. Even if you weren't protesting, he says, if the military determined you were young and Oromo, you would face a beating or imprisonment. Over the past few years, human rights groups estimate, more than 1,000 Ethiopians were killed by the state and tens of thousands were thrown into detention centers, where torture, as Wetumusa describes, was common. This, father and son both agree, was a painful struggle, but they have won. Their victory, they say, gives them a right to two other demands: that the capital should once again be administered by Oromia, and that the Oromo language should displace Amharic as the country's official language. Reminded that those two demands could prove highly combustible, Kemal responds without hesitating: "They are not negotiable." The issue of Addis Ababa is not simple. It has long represented the clash between the Oromo majority and the ruling class, a point of contention since the late 1800s, when Emperor Menelik II — an Amhara — staked claim to what Oromos called Finfinne. Today, Addis Ababa is a cosmopolitan city, a federal cutout in the middle of Oromia that is home to all ethnic groups and a source of much government revenue. Jawar, though, seems unconcerned about the capital's future. Unlike Kemal, he leaves room for negotiation — the federal government and the city's multiethnic residents have rights that should be respected, he says — but to him, the big issue is already settled: The territory of Addis Ababa has to be returned to the Oromos. "I don't see how that can be a radical proposition," he says, "if there is almost 100 percent consensus among Oromos." 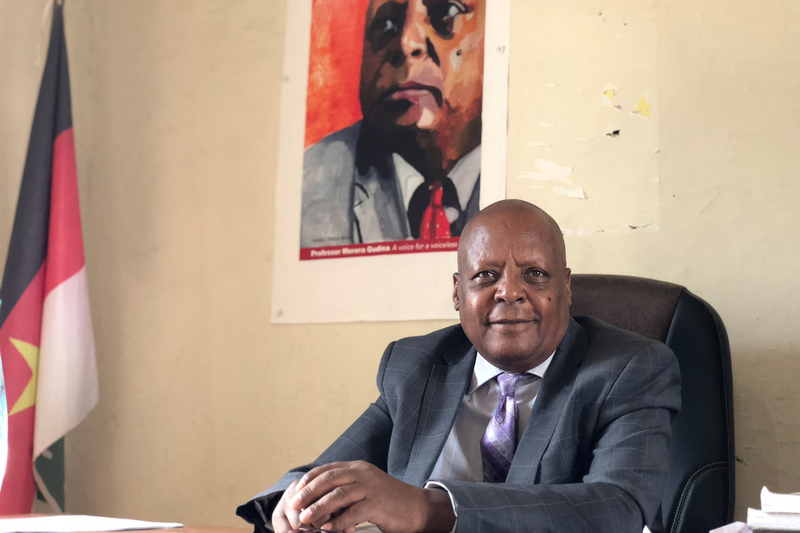 Merera Gudina, an Oromo and once the country's most prominent opposition politician, was released from prison thanks in large part to unrelenting qeerroo protests. These unresolved issues are the biggest danger in Ethiopia, he warns. "There are a lot of clashes of dreams," he says. If they can't be negotiated, he warns, the country will crumble. One minute, Jawar can be a hard-liner who dismisses any negotiation, and the next, a pragmatist who insists controversial issues can be resolved once the Ethiopian government becomes "legitimate" and people come to respect the law. In Ethiopia now, "No one has legitimacy," he says. Not even Ahmed, the prime minister, who came to his position by a decision of the ruling party rather than by popular vote. The uprising, Jawar says, was never about creating an Oromo state, but it was certainly about Oromos asserting their rights. "When I was in America, I was Oromo; I was African; I was American," he says. "We shouldn't be forcing people to choose; we should create a condition of complementary identities." In his mind, free, fair and credible elections are the answer. "Elections will enable us to have legitimate representatives of the various ethnic groups and a real ethnic bargain will begin," he says. "There will be conflicts; there will tensions. There will be communal violence every now and then, but that violence can be contained because you will have legitimate representatives." And if the process is fair, he says, he is willing to accept whoever comes to power — Oromo or not. "We fought for a democratic government," he says. "Not for a popular government. We don't care who is going to rule this place, but that person has to have the consent our people expressed through the ballots."